Athens taekwondo champion Moon Dae-Sung of South Korea was elected on Aug. 21, 2008 to the athlete's commission of the International Olympic Committee. Moon finished first among the 29 contenders that stood in the election at the Olympic Village during the Beijing Games. 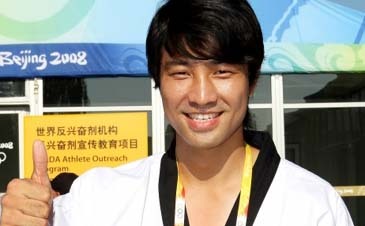 The 32-year-old, who took 3,220 of 7,216 ballots cast, is the first Asian athlete to be elected by peers as a member of the commission founded in 1981 to serve as a link between Olympic athletes and the IOC. Representatives from the 19-member commission are allowed to join meetings of other IOC commissions to deliver athletes' perspectives and voice their opinions on various matters, including doping and Olympic preparation. "I have rammed home the message that my leadership is going to be pure, powerful and peaceful," Moon said. "The world of sports is revolving around Europe and the United States, but I will work hard to voice Asian athletes' voices as well." South Korea has attempted to produce members of the commission since 2002, but has failed until Moon — a taekwondo icon and professor at home — became one of the four athletes to be newly elected for the eight-year term.